This thread will contain important information that will help you to get started with playing Modded Minecraft. There are literally thousands of mods out there, and they all do different things - some are useful (e.g. enabling players to better manage their inventory), some are educational (e.g. replicating ancient worlds) and some are just plain ol' fun (e.g. adding dinosaurs or letting players create enormous explosions). Add new blocks, items or mobs (animals and creatures). Change the way blocks, items or mobs look. Give players more control over the game. Modify or add new landscapes and terrain. Add new options for things like speed or graphics. Fix bugs that Mojang hasn’t gotten around to fixing yet. A really important thing to be aware of is that mods are created by other players and not by Mojang (the makers of Minecraft), so they're not an official part of the product. This means that if something goes wrong, you won't be able to get support or help from Mojang. If you have never played Modded Minecraft before, The very first thing to consider is your computer hardware. Different mods have different resource requirements, and every modpack is different. Generally the more mods you have in a modpack at once, the more resources it will use. To get your system specifications on Windows, Go to Start, Control Panel, System and Security, and then click on "View amount of RAM and processor speed". To get your system specifications on Mac, Click the Apple icon in the top left corner of your screen. From the drop-down menu, click About This Mac to open the System Information window. The System Information window will show you an overview of your system, including what version of OS X you're running, your model, your processor, your installed memory (RAM), your graphics card and your serial number. Once you have determined that your computer is capable of playing Modded Minecraft, The next step is to of course start installing Mods or install a whole Modpack. How do you install a Mod or Modpack? There's really no standard way to install a Minecraft mod because each mod is created by a different person using different methods. Most mods can be installed relatively easy by using Minecraft Forge. However, For simplicity's sake, I'm going to show you how to automate the installation of an entire Modpack using the Twitch Desktop Application. 1.) First, you will need to install the Twitch Desktop Application. You can download it from here. 2.) Once you're logged into the Twitch App, You will need to "Enable Minecraft". Click on "Mods" in the top menu, Look for Minecraft and click on it, Now click on the "Enable Minecraft" button. Once it is enabled, you will need to "Install" it. By using the Twitch Desktop App, you're actually installing a completely separate installation of Minecraft. This is recommended so that your original Minecraft installation that you use will remain untouched. 3.) Now you're ready to install a Modpack! Click on "Browse All Modpacks" and search for the Modpack you would like to install. DoD has a server with the "Direwolf" Modpack so we will search for that. Hover over the picture of the Modpack and click "Install". The Twitch App will now proceed to install all of the files required to play this Modpack. Once it is done installing, you will see a new "Play" button on the picture of the Modpack, Click this button to launch your newly installed Modpack! 4.) 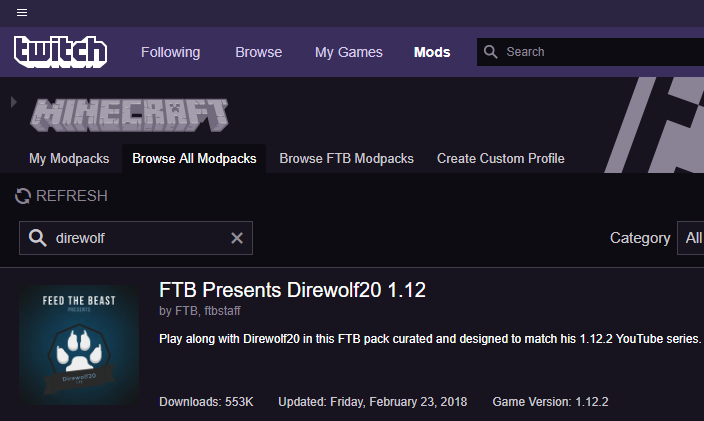 Once the Minecraft Launcher starts, you will need to switch your profile to "FTB Presents Direwolf20 1.12" and then click Play. 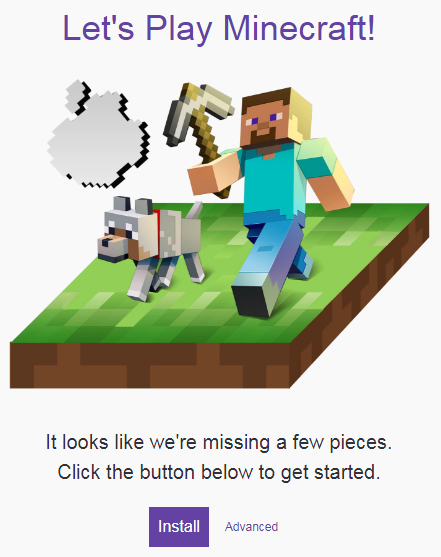 The Minecraft client will then start to download all the necessary files for Minecraft to run since technically this is a brand new installation of the game. Once that is done the client will then proceed to start loading all of the Mods in the Modpack. This step can take awhile depending on the number of Mods that it has to load, So please be patient. 5.) Once the Minecraft client is fully loaded, you are ready to join the server and enjoy! Click on Multiplayer and add the server play.dodedge.com. Once you're connected, execute the command "/server forge" and you will be connected to the server! That concludes this tutorial, If you have any questions or run into any problems, You can make a post here on the forum, Or contact one of the Staff. You can also contact us via our Discord server.